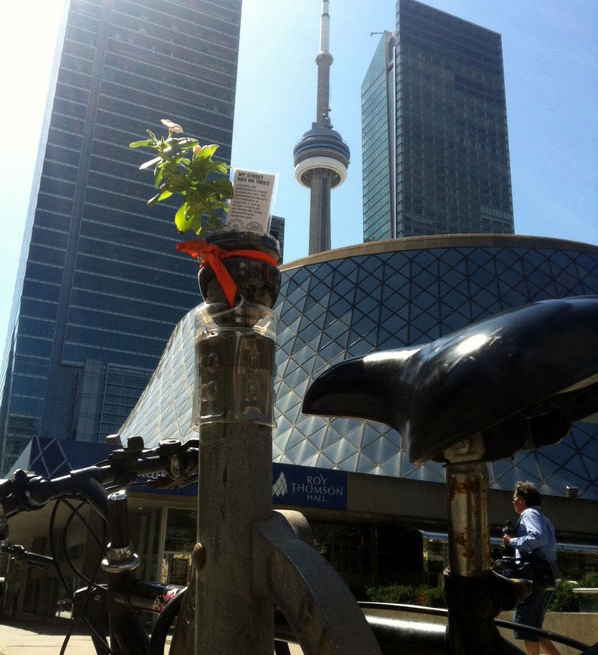 "My Street Has No Trees (MSHNT) is a public and participatory installation that utilizes the vestigial design of Toronto’s Post and Ring bike stands as armatures for micro-gardens. The intent of the project is to raise awareness about the imbalance between the hardscapes and softscapes of our streets, to encourage people to think critically about the transformative possibilities of our everyday environments, and to increase the beauty and joy of our neighbourhoods." Thanks so much for your comment - it will be reviewed before it is posted! For an explanation of why I named this online scrapbook/collection of clippings: Dandelions and Concrete. It all started in 2006 when I bought a house. At first it was an interest in creating a butterfly garden and then it blossomed into a backyard organic vegetable patch. Next I was eagerly reading about hedgerows and native bee condos and finally I went back to school in 2011 for Ecological Restoration hoping to combine my love for ecology with my urban planning degree. I have always loved what a city can offer but with my new found interests in the natural world I was wondering how we can be more connected to nature, support a biodiverse environment and live in harmony with the planet all while LIVING AN URBAN LIFE. This is my scrapbook of interesting ideas and articles that I have found online, where I can collect links and information as I learn from others in cyberspace about possible urban nature habitat, how cities can benefit from natural ecosystems (and enhance them!) and creative ways to build and adapt our cities to be more in balance with the natural ecosystem that is around us and THAT ULTIMATELY IS US. There is much knowledge out there and I want to bookmark it all! Starting 2015 off with… collaboration! All creatures great and small.